Valentine Toy Contest Starts Today Through February 12th. Post A Photo of Your Pet Now! The Sooner You Post, The Better Chances To Win! 7 lucky winners will win a free Valentine toy! 2 of the winners who have the MOST LIKES on our Facebook page will also receive the Valentine Treat Bag Grand Prize. The other 5 winners will be chosen from a random drawing on February 12th. 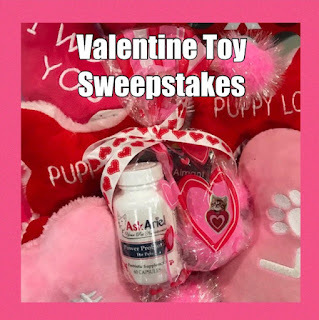 Valentine Treat Bag Grand Prize (2 winners with the most FB likes) will receive a free Power Probiotic, free shipping coupon, a Valentine toy and some healthy freeze dried treats. Note: Winners must be 21 years of age and a US resident. If you don't know how to post a photo of your pet on Facebook, please just email us what you would like to post and we can do it for you. Valentine Toy Contest Starts Today Through February 12th. Post A Photo of Your Pet Now! The Sooner You Post, The Better Chances To Win!